We would describe our son as caring, friendly, funny and adventurous. His friends and closed ones describe him as organised, helpful, fun loving, prankster and intelligent. We are a gursikh family living in Delhi. He is working for an MNC in Gurgaon as a Team Lead. His hobbies include painting, watching movies, playing guitar. Name Visible on Login has an elder sister who is married. Me and my wife are retired now. I would want my partner to be simple, caring, humorous, career-oriented, belonging to a respected family with values. I would want my partner to not just love me but also to consider my family as her own. Thanks and best of luck finding your partner. If you like my profile please send a message here.  The Sikh turban, more appropriately known as a dastar is an article of faith worn by Sikhs. We come from a middle class, nuclear family with traditional values. Our family lives in Delhi, India. His father and mother both have retired. He has one sister, who is married.